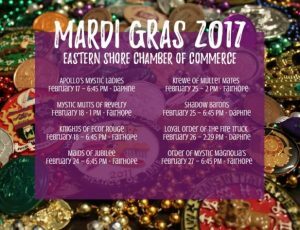 It'a Almost Mardi Gras Time! It’s almost Mardi Gras Time!! 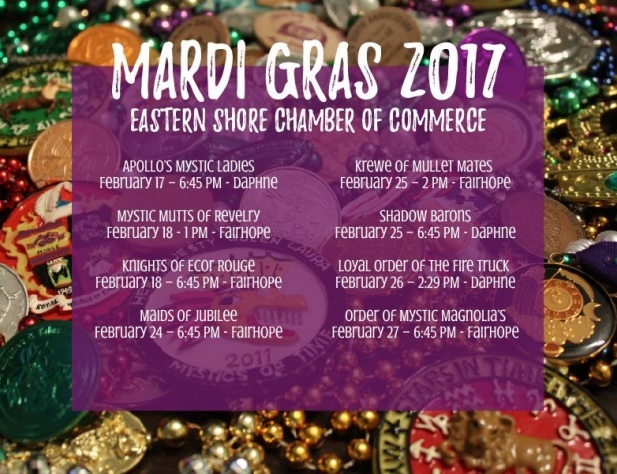 Mardi Gras started in Mobile back in 1730 with the first organized parades starting in 1840 and has grown to the surrounding areas of Mobile and Baldwin counties. Mobile sports the larger parades while the Eastern Shore parades are less crowded and kid friendly. When you come out to the parades this year you are sure to hear yelling and screaming and see dancing, marching bands, large floats, and plenty of moon pies and beads flying in the air. Most of all the activities will bring a smile to your face! Check out this years schedule!